FU Man Yi (a.k.a. Sonya FU, b.1982) is a visual artist from Hong Kong. Growing up in the former British Colony where East meets West, Fu is influenced by both Oriental and Western culture. Starting from 2010, Fu has exhibited in many art galleries and international art fairs around the world. Fu's work has been featured in many art publications including Curvy, Beautiful Bizarre Magazine and the Semi-Permanent art books. 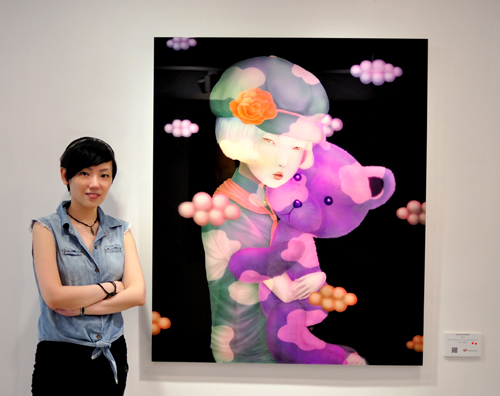 In 2011, Fu was endorsed by Semi-Permanent Hong Kong as a notable and emerging artist. In the same year, Fu was awarded with Perspective Magazine's '40 Under 40' which celebrates top young creative talent throughout Asia. Fu's chosen medium - digital painting - encompasses an intricate technique which Fu paints with very detailed and delicate brushwork. Being heavily inspired by her dreams and spirituality, Fu blends her subject matters with symbolic metaphors and the unseen beauties she encounters during Hypnagogic state - the transitional state between wakefulness and sleep. All of this combined introduces an eerie and obscure atmosphere in Fu's visual narratives. Copyright © Sonya Fu. All Rights Reserved.